By 1932 the depression had reached alarming proportions. But for Eatonville, it was about to get a whole lot worse. 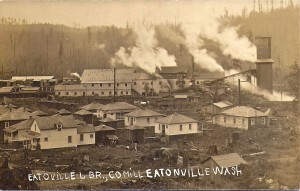 On December 8, the sawmill of the Eatonville Lumber Company went up in flames, destroying the town’s only large industry. In just hours, what had been one of the largest and most productive mills in western Washington was nothing more than blackened ruins. • The Unemployment League in town was cutting wood on F. M. Miller’s land for a new “farm to market” road. • A truck of Red Cross flour arrived in Eatonville on May 31 for needy families. • Haircuts went from 50 cents to 35 cents. • Many organizations were practically suspended because no one could pay dues. All that and more wasn’t enough to keep the town from rising to the occasion. 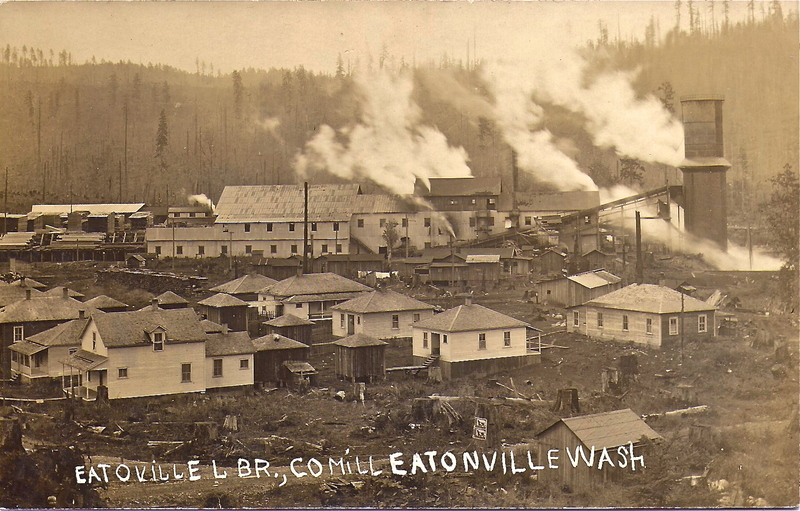 Despite the hardships, by August of 1933, the shingle mill of the Eatonville Lumber Company was up at running. The rest of the mill was being rebuilt. Maybe even more important . . . steps were that year to create a better, more organized fire department. Photo courtesy of Rich Williams, and information taken History of Southeastern Pierce County. I grew up knowing no other name for the Eatonville cut-off road, but “the Farm to Market Road”. I noticed that all the houses in town had seperate “Libraries” in their back yards, some even had covered walkways to them !! I’m sure indoor plumbing was way too expensive to have during the depression years. I remember that alot of summer ‘cabins’ at Clearlake still had outhouses, clear into the ’60’s. My Godparents, Lloyd and Margeret Hague, had a summer cabin, just two houses away from us, and they had an “outsider”, that I had to use a few times. I’m sure DEQ would shut them all down these days ! !